Editor's Note: Our usual reviewer, Scot Borofsky, is taking a month off, partly to devote time to his new outpouring of paintings. When he asked William Hays to sub for him, Scot didn't realize that his own work would become the subject of this month's column! The first handmade marks of recorded human activity are visual symbols and pictographs. In most ways, art and cultural history can be tracked by the increasing complexity of our visual language. Brattleboro painter Scot Borofsky takes his place in this continuum by exploring a contemporary symbolic language while embracing the history and universality of pictographs and glyphs. Borofsky was born and raised in Brattleboro. After high school he left rural Vermont to study briefly with Peter Grippe at Brandeis, then on to RISD and the Brooklyn Museum. He attended the Brooklyn Museum School on a Max Beckmann Painting Scholarship. Adopting New York City as his home base, he continued to travel and work at his art for nine years. These travels took him to Mexico, where his work was deeply influenced by the passionate and proud indigenous culture. The pre-Columbians affected Borofsky's drawing and painting through the complex sets of symbols and glyphs he saw on objects and in ruins. He began using a geometric structure in combination with biomorphic lines to create a new set of personal symbols, an alphabet for his personal vocabulary. Borofsky started finding strategic locations in New York and creating large-scale, spray-painted wall murals featuring his multicultural pictographs. In carefully positioned relationships, they could be seen as a larger part of the setting or viewed for their own sake. After a few exciting years in the East Village, with strong gallery representation, Borofsky was having his work positively reviewed in Art Forum, The New York Times, Art News and Art in America. In the early 1990s, Borofsky returned to Vermont with his new wife and awaited the arrival of their first child in his hometown. Borofsky worked toward a stylistic synthesis of the symbols and stylized landscape environments in oils and in works on paper. He spent years exploring the use of his graphics in combination with increasingly deliberate and active application of paint. He wove the graphics into a variety of settings and used them as narrative elements of the paintings. During a bold series of paintings based on the events of September 11, 2001, the language he had developed for decades flowed in a different way than before. 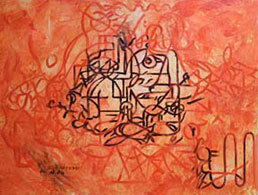 It transformed from individual symbols to a calligraphic mass, a web of forms. His new use of the calligraphy shouted in a plethora of voices echoing the collective horror of the attacks. His application of paint grew increasingly confident and direct. His writing became an extension of the subconscious. 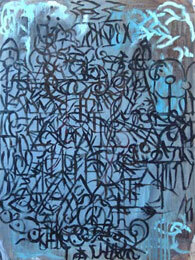 Years of practice and repetition metamorphosed into a new dynamic expression. Within a series of more than 20 small works, each of the 9/11 paintings shifted slightly to present a particular point of view in response to the profound scale of destruction and lives lost. The compositions pierced the prevailing media imagery of the disaster with a deep, personal resonance. Eventually Borofsky built on these focused points of view to formulate a large-scale response. The resulting "Cataclysm" imposed a telescopic lens on the space between the heart of the explosions and chaos. He drove even closer to the center of the event in the next large painting, "Conflagration." More than a year after 9/11, Borofsky distanced himself, becoming more of a spectator. The climax in his series (still untitled) changed point of view and enlarged the scale (8 x 12 feet) to create a field of vision encompassing a crystalline skyline of ghostly buildings against the flaming twin towers. Passing time has now allowed Borofsky to segue into a different approach. He has simplified his process to focus on fundamental elements of composition, color, the figure-ground relationship, calligraphy and mass. Some of the recent paintings still hold onto a created spatial environment, a suggested landscape. 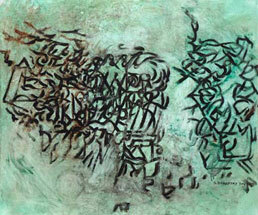 But the calligraphic elements dominate in masses that serve to direct the composition. At their best, the new works begin to leave behind atmosphere and light. They flatten into a more subtle figure-ground relationship that allows the calligraphy to speak clearly while the ground holds our interest with well-chosen combinations of color applied in a minimum of painted and overpainted layers along with wiping of the surface in turn. 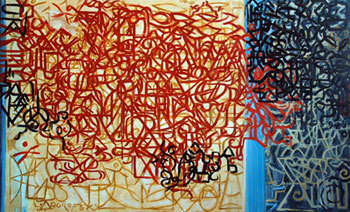 The real magic in the latest paintings is the calligraphy. The symbols are woven together over a gridded structure that is never too heavily relied upon while providing order. They are painted/drawn with an assured hand that, at times, harkens to East Asian calligraphy. The curves, spirals, circles and lines interweave to form large shapes within the whole, giving the compositions motion. 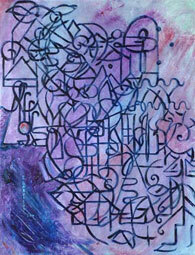 Individual symbols come out of the weave differently for each viewer. The meaning and content of each painting becomes something of a psychological game since every viewer sees different symbols and derives different meanings. Individually each symbol is a word or an idea. Together they are a multitude of voices speaking in full sentences. In a 1985 review of Borofsky's exhibition in New York City, Suzaan Boettger in Art Forum observed, "Pervasively discernible in Scot Borofsky's painting and sculpture is a mystical impulse striving to find a contemporary voice." Borofsky has found that voice -- not a capricious rant of youth; rather, a voice that transcends time and culture to reach the viewer through a visual cacophony of fully developed, pancultural marks carrying a message -- a message that has far reaching implications for the return of a visual, spiritual and psychological language containing the reach to speak to a wide spectrum of the audience with a very personal touch.